Charise Creates: Mollie Makes Patchwork & Quilting and A Give-away! 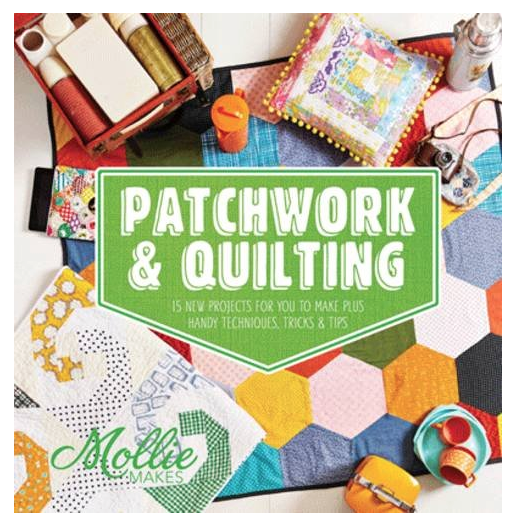 Mollie Makes Patchwork & Quilting and A Give-away! Some months back, I was asked to contribute to the book "Mollie Makes Patchwork and Quilting." Of course I jumped at the chance! The publisher, Collins and Brown, asked for a paper pieced project to add to this skill building quilting book. It was a fun project to design. I was inspired by vintage laundry bags, and my favorite paper piecing patterns to make - clothing! 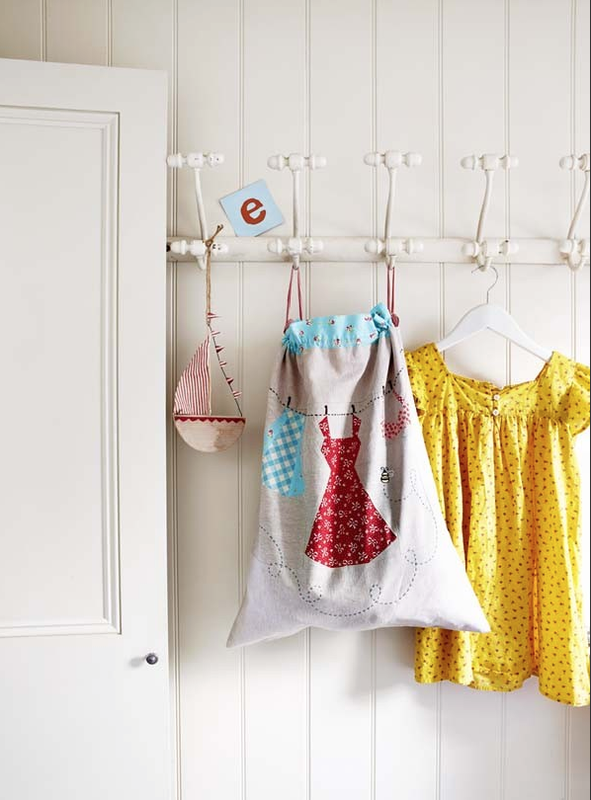 The individual clothing blocks are very easy to make and a fun way to combine some prized fabrics. The bag is easy to construct and has a contrast drawstring top with contrast trim. I chose to use a coordinating fabric from the A-line skirt. And a red gingham lining to match the ribbon. It is a lovely book filled with wonderful projects. On my list it make is this adorable camera case. And this sweet tea cozy. Pavilion books sent me a extra copy so I am having a give away. Please leave a comment sharing if you are making any Holiday gifts and what you are making. Comments will be open until Sunday 10:00 p.m. PST. Open to United States addresses only. I love your bag, the book looks very inspiring. I am making a quilt, ornaments (cross stitch and embroidery) and food. I'm making a quilt for a special person and going easy on myself for everyone else's gifts by making them easy rice handwarmers. I'm working on a Christmas stocking for my grand daughter and I've also started a Christmas sampler quilt. Love your design!!! I am making zipper pouches for the girls in the family. I love your laundry bag, Charise. I've been making lots of Christmas gifts. Christmas ornaments, table toppers, cushions and other things. Thank you for the lovely giveaway. That laundry bag is adorable! I gad good intentions of making things but I am recovery from 5 weeks with the shingles. Maybe I will make them valentine gifts! Fun stuff! 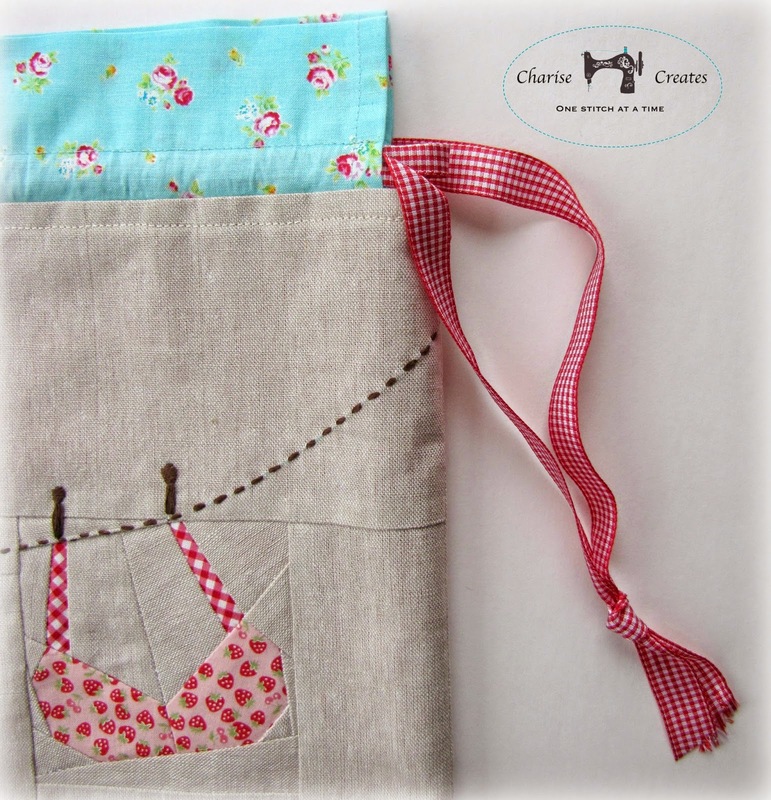 I've made a drawstring project bag for my DIL, and I'm making her a sewing kit in a book, as well. I've been making your mini cottage ornaments, pincushions, and tissue covers. Thank you for this awesome giveaway. I am see busy this month making mini patchwork stockings, advent calendars, happy hexagon trivets, scrappy ornaments and of course, the quiltyfun Christmas see along. I love this holidays! What a sweet little bag! I love the tea cozy too! Thanks for the giveaway! I've made zipper pouches, appliqued tea towels, and some fun felt decorations! Thanks for the chance to win a copy of this book! I'm making some infinity kids scarves and a zippered boxy pouch for my hubby! Thank you for giving your extra copy away of this adorable book! I have made sugar scrub, quilted mug rugs, and glitter ornaments. I love the laundry bag. It is adorable. Congratulations - I love your bag! That is just so cute.... I'd use it for so many things. Thanks for the giveaway.... they book looks great. I'm all done with Christmas projects.... all of them were simple, like table runners. Thanks! As always, I am in love with you creations!! This bag is wonderful. I am making house ornaments for grifts this year. Thank you for the chance to win a copy of this book! The kids and I are making some ornaments and if I get my act together I may make some Dala horse pillows. Oh my. How beautiful. I'm working on a few small quilting projects for Christmas and lots of food gifts. I'm making some smaller gifts like pouches & Kleenex covers. I hope to squeeze in a table runner & quilt but highly doubtful. i am making folded star ornaments and zip pouches. Congratulations! I love your new pattern. I'm paper piecing some wildlife pillows for my dads trailer. HI, I'm making some Christmas ornaments, watercolor greeting cards and earlier I did a piano runner. Thanks for your Blog and Inspiration and a neat giveaway! I love your design and this book looks sew fun. I am making hotpads, notebook covers, scissor holders and vinyl tool pouches for stocking stuffers and gifts for quilty BFF's. I am having lots of fun making these small projects. I'm working on a table runner! Thanks for the giveaway! I always make new Jammie's for the Kiddo's every Christmas..& now have a few Grankiddo's to maske for too!~ :) Also working on 2 Wallhangings & a crocheted afghan....busy Mom! :) I loooooove your Bag...toooo pretty for Laundry! Your bag is lovely. These projects look like so much fun. I am making a baby quilt for a new great niece and a pin cushion for my sons fiancé. It will be civil war fabrics from her wedding dress and his wedding shirt. I love your bag! This year I am making new stockings for our family. They are vintage and shabby chic looking and no names. And bigger for adult children. That way we can add to them as time goes on too! I made a rag quilt for my daughter in law. I am getting a late start but I am hoping to make some mug rugs and pouches for gifts this year. I really love your laundry bag! I am making a wall hanging and some needle keepers for my quilty friends. Have some other small projects planned if I have time.Thanks! I adore your laundry bag. As for handmade gifts this year, I have been playing with my hexagon trim tool and making potholders… super fun!! I am working on several Christmas projects...2 quilts and making gift tags and Christmas cards. Lovely work - I love your bag! This year I am making a Scottie Dog pillow for my dad and some new holiday stockings for my family! Thank you! 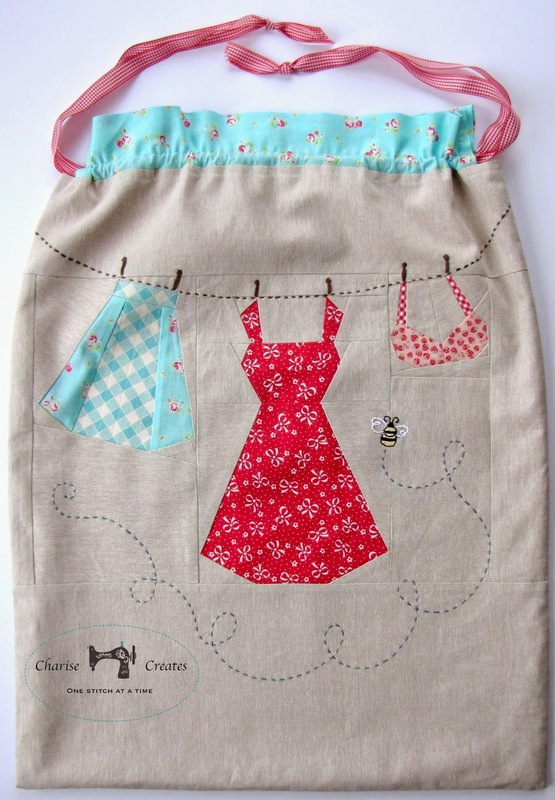 What a lovely laundry bag and all these beautiful projects in the book. Yes I would like to win this one, love it. Thank you for the opportunity, great give-away. 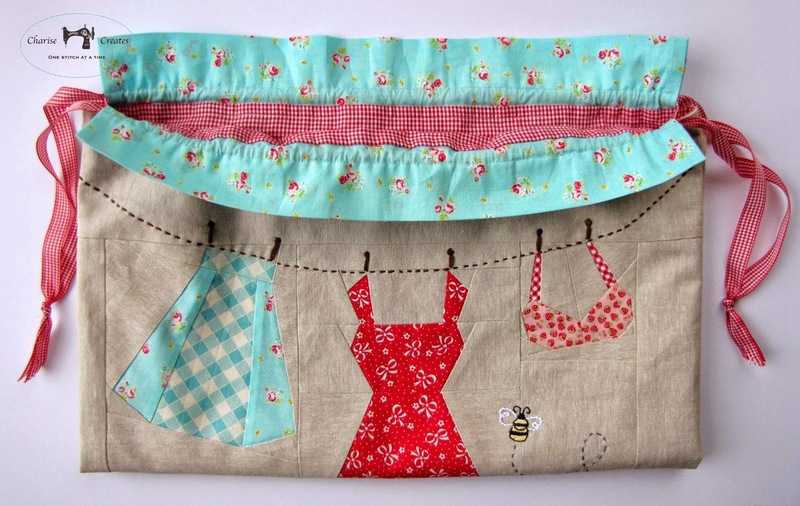 Such a darling laundry bag ~ you make the sweetest things! Thanks so much for the chance ~ I'd love to have this book! I made a rag quilt for my grandson and am working on placemats! I am making a quilt for my husband - he wants one so much! Mug rugs and a pocket book and a pillow or two are my christmas gift giving projects, love you laundry bag and the book looks very nice. Thanks for the give away. Such a cute book! I love the projects, thanks so much for the giveaway! Love the designs. I am done. I made 3 quilts, potholders, moppines, ornaments and lots of secrets. Oh, Charise, that is so cute! I love it. I'm afraid I'm not making much this year. I make Christmas ornaments for our kids. Lately, I have been using felt. I'd better get moving on those! I still haven't finished the one for my late daughter from last year, so you can see how slow I am. No handmade gifts from me this year, unfortunately! I love your laundry bag, it is beautiful! My handmade gifts this year are a Christmas tree skirt and a table runner. I'm making quilted pillows, "sunnies" eyeglass cases and I played along with Lori Holt's #haveyourselfaquiltylittlechristmas and made the quilt! Tons of fun!